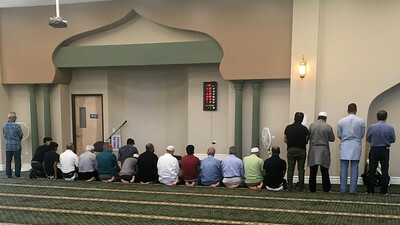 SAN JOSE, California — On Sunday, June 24, 2018, more than fifty Jews, Christians and Muslims united at Evergreen Islamic Center to prepare a meal for the homeless and hungry of San Jose. Orientation was led by Henna Parekh of Evergreen Islamic Center, Scott Parker of the LDS Church, and Iris Bendahan of Congregation Beth David. Volunteers enjoyed sweet baklava while getting acquainted in small buddy groups before working together to prepare dinner for residents and guests of Cityteam Men’s Recovery Center. Volunteers prepared a fruit salad, green salad, fresh squeezed lemonade and roasted chicken. Some volunteers traveled from Santa Cruz and San Francisco to participate. Many thanks to Chef Reynolds Stewart who oriented volunteers to kitchen facilities at Cityteam; to event leaders Henna Parekh, Scott Parker and Iris Bendahan who planned and prepared for countless details; and to all AAi donors who made the event possible. Most of all, thanks be to God الحَمْد لله‎ ברוך השם for providing us all the strength and resources for this united effort to serve our neighbors in need. Photos courtesy of Mir Islam and Sam Parker. Photo curation by Annah Liyah.